Moskva and Moscow are two different renderings of the same Russian word Москва. The city is named after the river. Finno-Ugric Merya and Muroma people, who originally inhabited the area, called the river Mustajoki. It has been suggested that the name of the city derives from this term, although several theories exist. 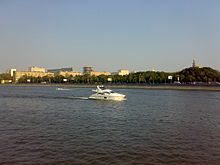 To distinguish the river and the city, Russians usually call the river Moskva-reka instead of just Moskva. The river is 503 km (313 mi) long, with a vertical drop of 155 m (509 ft) (long-term average). The area of its drainage basin is 17,600 km2 (6,800 sq mi). The maximum depth is 3 metres (9.8 ft) above Moscow city limits, and up to 6 metres (20 ft) below it. Normally, it freezes in November–December and begins to thaw around late March. In Moscow, the river freezes occasionally;[contradictory] during an unusually warm winter in 2006–2007, ice began melting on January 25. The absolute water level in downtown Moscow is 120 metres (390 ft) above sea level (long-term average of summer lows after World War II); a historical maximum of 127.25 metres (417.5 ft) above sea level was set by the 1908 flood. The main tributaries are the Ruza, Istra, Yauza, Pakhra, and Severka rivers. Sources of water are estimated as 61% thaw, 12% rain and 27% subterranean. Since completion of the Moscow Canal (1932–1937), the Moskva River has also collected a share of Upper Volga water. This has enabled reliable commercial shipping, which was previously interrupted by summer droughts (older dams built in 1785, 1836 and 1878 were not effective). The average discharge, including Volga waters, varies from 38 m3/s (1,300 cu ft/s) near Zvenigorod to 250 m3/s (8,800 cu ft/s) at the Oka inlet. The speed of the current, depending on the season, varies from 0.1 m/s (0.33 ft/s) (winter, dams closed) to 1.5–2.0 m/s (4.9–6.6 ft/s) (May, dams open). Moscow (Москва́), the capital of Russia, is situated on its banks. 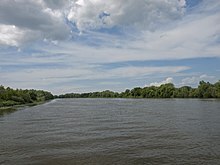 The river also flows through the towns of Mozhaysk, Zvenigorod, Zhukovsky, Bronnitsy, Voskresensk, and — at the confluence of the Moskva and Oka — Kolomna. As of 2007, there are 49 bridges across the Moskva River and its canals within Moscow city limits; the first stone bridge, Bolshoi Kamennyi Bridge, was erected in 1692. Within the city, the river is 120–200 metres (390–660 ft) wide, the narrowest point being under the Kremlin walls. Drinking water for the city of Moscow is collected from five stations on the Moskva River and from the Upper Volga reservoirs (north and north-west of the city). Balchug Island, also known as Bolotny Ostrov, lying just opposite the Kremlin. The island was formed by the construction of the Vodootvodny Canal in the 1780s, and has no official name in Russian. Moscow residents informally call it "Bolotny Ostrov" (Bog Island) while members of Moscow's English-speaking community refer to it as Balchug. There is a fleet of river ice-breaker cruisers which ply routes from moorings at the Hotel Ukraine and Gorky Park to the Novospassky Monastery and back. Duration of trips ranges from 1.5 to 3 hours. 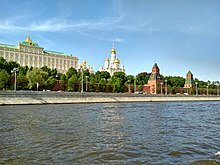 Wikimedia Commons has media related to Moskva River. ^ Москвичи смогут поплавать на ледоколах. Water transport (in Russian). Moscow, Russia: [Gudok.ru]. 2009-11-13. Archived from the original on July 26, 2011. Retrieved 21 November 2009. "Moskva" . Encyclopedia Americana. 1920.